Although road trips are great, every now and then I yearn for the road less traveled. I vividly recall one such time, as we neared the end of yet another epic car trek in southern New Mexico. The urge to hop off the interstate for a scenic detour nearly overwhelmed me, so I did a little research on our overnight stop in Las Cruces. The next day we headed north on Interstate 25 in search of the southern segment of the Geronimo Trail National Scenic Byway (575-894-1968, www.geronimotrail.com). Truth be told it wasn’t that difficult to find, but once we turned west on Highway 152, just south of Truth or Consequences, it was as if we had entered another world. Not only did we leave the bulk of the cars and tourist traffic behind, but we also enjoyed some gorgeous panoramic views, happened across more than a few quirky diversions, and even discovered a nice accessible cottage in a former silver mining boomtown. Although the official route runs from Interstate 25 to San Lorenzo, we also opted for a suggested side trip down to Lake Valley ghost town. It’s not hard to find — just make a left on Highway 27 in Hillsboro. It’s just an 18-mile drive to the site, and it’s rare to spot another car along the route. A small sign marks the turnoff to the former town, and a short graded dirt road leads over to the official welcome center at the schoolhouse. OK, “welcome center” might be a bit of an exaggeration, as there are maps in the mailbox and a sign to ring the bell if you need additional assistance. We passed on the latter, as the map seemed sufficient. Founded in 1882, Lake Valley was a thriving metropolis during the silver boom. Sadly the prosperity ended in 1893 when silver was devalued, and although there were attempts to revive the town in the 1920s and the 1950s, all but a handful of devoted citizens left for greener pastures. The last resident left in 1994, and the town site was subsequently turned over the Bureau of Land Management. Today you can take a self-guided tour around the site, which includes the remnants of the chapel, stone store, a few residences, the water tower and a coal sorter. The paths are level and wide and doable in a wheelchair, but if you have problems with distances, you might want to drive instead. It’s truly a ghost town in every sense of the word, as nary a soul is left there! Back on the official route, Hillsboro is also worth a stop. There’s no accessible parking, so it’s best to park on the cement slab near the accessible pit toilets, across from the Black Range Museum. The museum has steps up into it, but you can wander along the road and look at some of the other old buildings that date back to 1870. Although Hillsboro has seen better days, it’s a downright thriving metropolis compared to Kingston, the next little burg up the road. The big attraction is the Percha Bank Museum, but even that’s up for sale. Still, you can peer in from the outside before you move along. Amazingly enough we did find a nice little accessible cottage, just up the street at the Black Range Lodge. 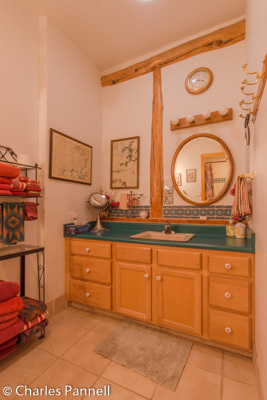 (575-895-5652, www.blackrangelodge.com). Although the lodge itself is located in a historic building, with steps at the front, the cottage was built from the ground up to be wheelchair-accessible. There’s plenty of room to park even the largest van right in front of the cottage, which was originally constructed for the owner’s wheeler father. From the parking area there’s level access to the front door and ramp access to the deck. 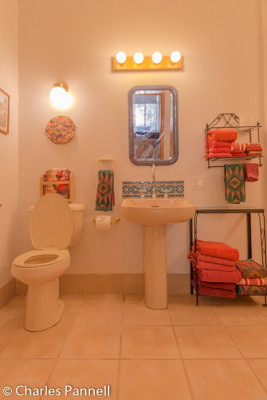 Inside, the floors are cement and tile, with plenty of room to navigate a wheelchair. 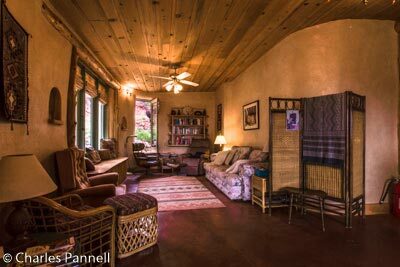 The front room is furnished with a sofa and chairs, and the adjacent dining room has a dinette set. 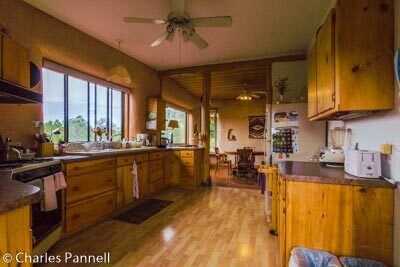 The well equipped kitchen has everything you’ll need to prepare a gourmet meal, and if you’d like to barbeque, there’s a grill on the back deck. The bedroom has a 29-inch high platform bed, with wheelchair access on both sides; and if that’s too high for you, the sofa bed in the living room is 12 inches high. There’s a standard Jacuzzi tub in the bedroom, and best of all there’s also a door out to the deck. 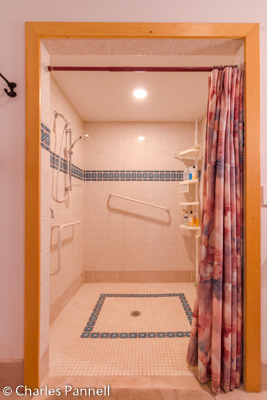 The bathroom has an enormous five-foot-square roll-in shower with grab bars and a hand-held showerhead. All in all, except for the lack of a shower chair, it’s pretty well equipped. 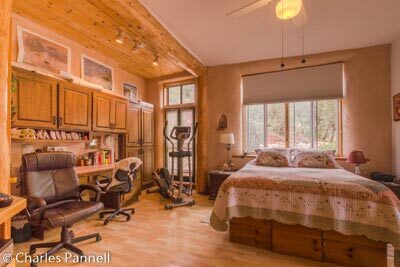 I will add that this isn’t your typical rental home, as there are clothes in the closet, personal items galore and even food in the cabinets, but it’s out-of-the-way and the owners keep to themselves. And of course, the deck is the perfect place to relax after a long day on the road. The next day we carried on along the Geronimo Trail National Scenic Byway and made one final stop at Emory Pass, just nine miles west of Kingston. The road gains nearly 3,000 feet by the time you get to the 8,228-foot pass, and the windshield views along the way are spectacular. There’s paved parking in the viewpoint lot, and although it’s not striped, there’s plenty of room for an accessible van. From there; it’s a level roll out to the viewpoint, where you’ll get a bird’s eye view of the surrounding mountains. There’s also a picnic table near the overlook, and although it’s not accessible it’s usable for most wheelchair-users. Additionally, there are accessible pit toilets near the parking area. It’s just a very pleasant place to stop, and a nice way to end the drive. After we took in the view, we continued along Highway 152, turned south on Highway 180 and rejoined Interstate 10. Although the Geronimo Trail was just a short detour, it offered respite from the highway hustle and bustle, and provided a brief glimpse into a bygone era. So the next time you yearn for the road less traveled, consider this out-of-the-way scenic gem.